by John Eisler, a 2014 Judge K.K. Legett Fellow at the Washington Legal Foundation and a student at Texas Tech University School of Law. The United States Court of Appeals for the Fifth Circuit, in a per curiam opinion, emphatically reversed, concluding, “the district court’s opinion misapplies proximate cause analysis and further, even if proximate cause had been proven, the injunction is an abuse of discretion.” Aransas Project v. Shaw, — F.3d —-, 13-40317, 2014 WL 2932514 (5th Cir. June 30, 2014). The Fifth Circuit’s welcome reversal restores proximate cause to its rightful place. Establishing Fault. In the U.S. common law system, the plaintiff has the burden of establishing both “but-for” and proximate cause. But-for cause is easy: If not for the defendant’s actions, would the injury have occurred? Alone, this is not enough to assign fault, because “[i]n a philosophical sense, the consequences of an act go forward to eternity, and the causes of an event go back to the dawn of human events, and beyond.” No one blames the tornado in Texas on the butterfly that flapped her wings in China months earlier. That’s where proximate cause comes in. Any attempt at a concise definition is futile, but things like foreseeability and intervening factors play a part. Every first-year law student is exposed to the concept through the flapper-era case, Palsgraf v. Long Island Railroad Company, where two train attendants tried to assist a passenger jumping onto a train that was leaving the station. As they helped him regain his footing, he dropped the small, nondescript, newspaper-wrapped package he was carrying. When the package hit the ground, an explosion of fireworks surprisingly burst out and, reportedly, flew across to the other side of the platform, knocking down scales and injuring Mrs. Palsgraf. She sued the railroad company as the responsible party. Clearly, the two train attendants were a but-for cause; yet should we, as a society, hold them and their employer liable for trying to help a man on a train? The Court found that exploding fireworks were not “apparent to the eye of ordinary vigilance” in helping the man through “an act innocent and harmless” and held the railroad company not liable for the lady’s injuries, but even in this seminal case the judges were split 4–3. Facts of Aransas Project. The TCEQ is the Texas agency tasked with administering surface water permits from the Guadalupe and San Antonio rivers; permits are granted for typical beneficial uses. 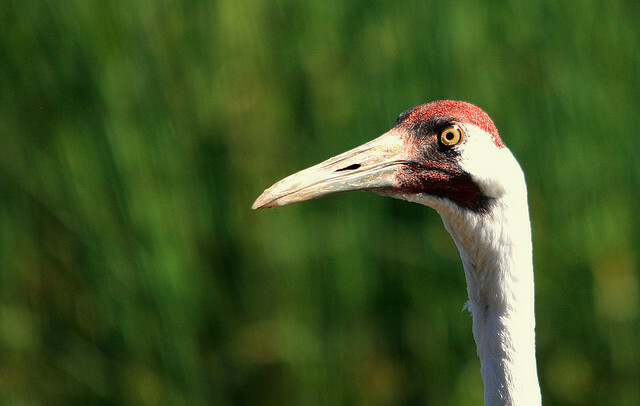 The whooping crane is a majestic, endangered bird that is five feet tall with an eight-foot wingspan. The world’s only wild flock winters in the Aransas National Wildlife Refuge, near Corpus Christi, and migrates in the summer to Wood Buffalo National Park in Canada. South Texas experienced drought conditions in the winter of 2008-2009. The utilization of water permits combined with the drought to reduce freshwater inflows to the San Antonio Bay ecosystem, which increased salinity and decreased the drinkability of the water, which together contributed to “a reduction in the abundance of blue crabs and wolfberries, two of the cranes’ staple foods.” Less available food made for a tough winter as the plaintiff’s expert, a refuge biologist and former U.S. Fish & Wildlife employee, discovered four emaciated whooping crane carcasses and estimated a total of twenty-three cranes died that season. To obtain an injunction, a plaintiff must show the defendant’s actions constitute a “reasonably certain threat of imminent harm to a protected species.” Without proximate cause established and considering the flock at the refuge has been steadily growing in size in the years before and after 2008-2009, the plaintiffs’ claims failed to meet this standard. First, the state already has programs in place to maintain instream environmental flows moving forward. A flurry of senate bills in the last twenty years have split the state up into sixteen smaller regions with “water planning conducted from the ground up,” while the state’s main agencies provide research, consultation, and funding. Since 2007, any new or amended surface water permit requires the TCEQ to consider freshwater inflows and estuary needs before issuance. The new permits also include a provision authorizing the TCEQ to adjust those permits to protect inflows for situations just like this. Second, the plaintiffs already had an available remedy in place. Water rights can be sold, leased, or transferred in Texas; sellers can be found at the state’s Water Bank. There is also the Texas Water Trust, which allows for either temporary or permanent placement of water rights in the trust as instream flows “to help preserve aquatic life and habitat and ensure their availability for future generations.” Contracting directly with water permit holders would have been both a more effective and efficient means to save the whooping cranes’ habitat than frittering away money on lawyers’ fees and time in courtroom battles. Whether it is ever possible in the Fifth Circuit to force a federal environmental statute into the calculus of a state actor authorizing water permits remains unresolved. At least state officials can take solace in the fact that psychic powers did not become a requisite job skill. Faced with a decreasing supply of freshwater, depleting groundwater, and a surge in demand from the state’s booming population—their job is tough enough already. Concerned environmental groups also need to realize the best use of their resources is as a direct market participant or collaborative voice in the regional planning process. The water situation in Texas is dynamic and requires cooperation, planning, adaptability, and quick action by those closest to the situation—not intervention and red tape from Washington. 248 N.Y. 339, 352 (1928) (Andrews, J., dissenting). Aransas Project v. Shaw, 930 F. Supp. 2d 716, 725 (S.D. Tex. 2013) rev’d, 13-40317, 2014 WL 2932514 (5th Cir. June 30, 2014). W. Keeton, et al., Prosser and Keeton on the Law of Torts 264 (5th ed. 1984). Palsgraf, 248 N.Y. at 342. Though the famed Justice Cardozo wrote the majority opinion, Judge Andrews’s quote in the dissent (from above) often gets all the glory. TEX. WATER CODE § 11.023. Aransas Project, 2014 WL 2932514 at 2. See Edwards Aquifer Auth. v. Bragg, 421 S.W.3d 118, 148 (Tex. App. 2013); Edwards Aquifer Auth. v. Day, 369 S.W.3d 814, 844 (Tex. 2012), reh’g denied (June 8, 2012). The district court repeatedly referenced TCEQ’s new emergency suspension abilities under WATER § 11.053 but failed to note such actions are subject to § 11.024’s priority preference order, of which environmental flows are last. The district court discarded this legislation as having “no teeth” because, in the event of an emergency, it places human needs above those of the environment. Aransas Project, 930 F. Supp. 2d at 744. The Fifth Circuit did not address this argument. Surely, this is a planning issue: S.B. 3, as codified, specifically states “recommendations for state action to protect instream flows . . . should be developed through a consensus-based, regional approach involving balanced representation of stakeholders.” WATER § 11.0235 (d-6). Aransas Project, 2014 WL 2932514 at FN 9 (internal citations omitted).